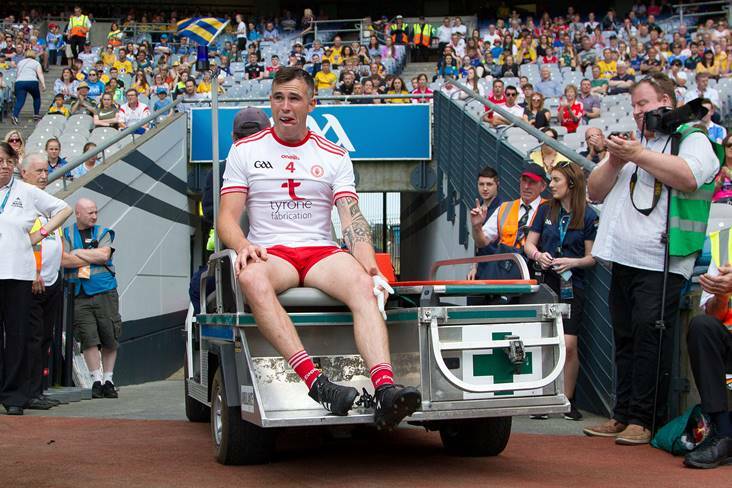 Tyrone's Cathal McCarron leaves the field injured. Tyrone will be without defender Cathal McCarron for this Saturday's Super 8s meeting with Dublin in Omagh. The Dromore native suffered a knee injury during the early stages of the Red Hands' 18-point win over Roscommon four days ago and manager Mickey Harte has since confirmed that he will not partake in this weekend's clash against the All-Ireland champions. "It wouldn't look like he'll be available for this week, for sure. He's had an x-ray, which doesn't tell you an awful lot, but he has to get a scan on it, so we won't know until the scan is done," Harte told The Irish News. "It's a knee injury, so we would be concerned about it." However, there is good news for the Tyrone boss in that Division 1 National League top-scorer Lee Brennan will return to action after having missed all of the qualifier series with a hamstring injury which he aggravated in May's Ulster championship loss to Monaghan. Harte has also confirmed that Colm Cavanagh is available this weekend after shipping a heavy knock against the Rossies at Croke Park in what was the first ever game in the newly formatted quarter-final stage.